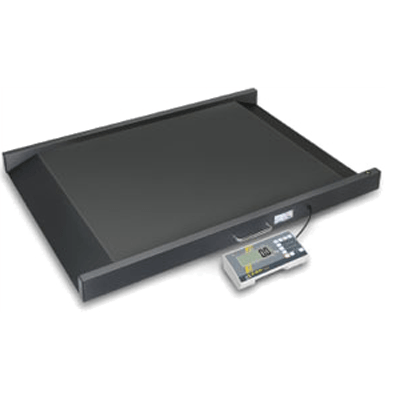 Product information "Wheelchair platform scale K-MWS"
The verifiable wheelchair scale K-MWS is an affordable model in the wheelchair scales and is suitable for everyday use. 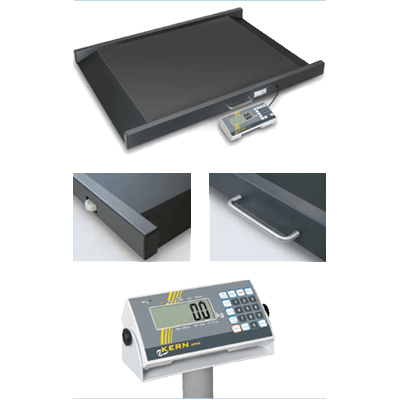 This scale is suitable for use in hospitals and clinics through their certification and medical approval. With the BMI function, you can easily evaluate the nutritional status of the patient and recommend a nutrition plan with weight control. The ramps are integrated into the wheelchair scale and facilate the driving on of the wheelchair. With two built-in transport wheels the wheelchair scales can be easily transported from one place to another. Optionally, a handle set can be ordered for self-assembly to the wheelchair scales. The weight of the patient is displayed in 100 g. The indicator has a high-contrast LCD display for easy entry and reading of patient data, such as the size, to calculate the BMI. The unladen weights of wheelchairs can be directly entered using the numeric keypad (Pre-tare). Even with restless patients you always receive accurate and stable results. The scale is powered by a battery with which up to 100 hours can be operated. The wheelchair scale K-MWS islegal for trade according to the international OIML verification class III and comply with the Medical Device Directive and the EC Directive 93/42/EEC. The scale can be delivered legal for trade. For applications that require verification, please order verification at the same time. Verification at a later date is not possible! Related links to "Wheelchair platform scale K-MWS"
* For applications that require verification, please order verification at the same time. Verification at a later date is not possible!